It's summer! For many of you, this means time off, the end of school, vacation, and traveling to the beautiful (I may be a bit biased) state of Florida. Theme parks are a popular destination for families with children and- as someone who has grown up near the parks- I have seen how a few mistakes or visitor oversights can take a family vacation from magical to a complete nightmare pretty quickly. Knowing that not everyone has had the advantage of learning how to best navigate a day (or a few) at the parks, I decided to finally put my tips into a list for you all. This tip is number one for a reason. It is one of the most important and the one that I see causing havoc most often. It is hot here. Especially in the summer. I often "joke" that our summer weather is by definition a "hellscape". I know some of you may be thinking it gets hot where you live as well. But PLEASE, I beg of you, just take my word on this one. Florida weather can be dangerous in the summer if you're not consciously taking in water throughout the day. Especially if you're not acclimated. So many visitors have their day at the theme parks cut short by a trip to the hospital for severe dehydration or heat stroke. The heat is bad... and the Florida sun is intense. The combination of the two can cause more than just discomfort. So drink water or a combination of half Gatorade, half water often throughout the day. Soda and tea do not adequately hydrate. I can not stress that last sentence enough. Also, make sure your kids are drinking enough. Even if they say they are not thirsty, have them take little sips as you wait in line or walk the park. Dizziness, nausea, lethargy, and headache are all signs of dehydration. Because it is sweet summertime many people will be enjoying the parks along with you. This usually means long lines for everything. One way to beat the long line for food is to eat at non-peak times. For example - eat lunch early -around 10 or 11am - or later -around 2pm- instead of eating between 12 and 1pm. You may still have to wait, but you will at least miss the "rush hour" of dining. Are you still stuck on the phrase "long lines" from the last tip? Don't worry, there is a way to beat the long lines for the rides as well. Fast/Express passes are a must for anyone visiting any of the major theme parks in the summer. Fast/Express passes allow you to essentially bypass the long line for a much shorter one. Fast passes are free at Disney World Parks but you are limited to three per park per day. Universal charges extra for their Express Passes but in my opinion, it's well worth the additional cost. 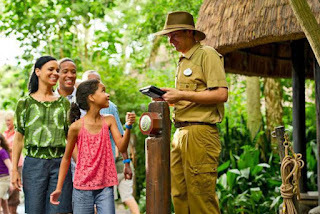 For more information on Disney World's Fast Passes click here. For more information on Universal's Express Passes click here. This pass goes by a variety of different names. I always knew it as the Guest Assistance Pass but the official name for it at Disney is the Disability Access Service Card. At Universal its called the Attraction Assistance Pass. This is a pass specifically for guests with disabilities (including disorders that are not visible- such as autism) who can not wait in long lines or who may have a lot of difficulty waiting in long lines. It is NOT a fast/express pass. Guests using an assistance pass will receive a "come back" time (a time to come back to the attraction/ride) that is equal to the wait time. For example- Say it is 2pm and the ride has a 1-hour wait. The guest using the assistance pass will most likely receive a come back time of around 3pm. When the guest returns to the ride at 3pm, they will be let directly onto the ride. The assistance pass pretty much acts as a place holder for your place in line. To request and receive a Guest Assistance Pass at any of the major parks, simply go the park's guest services office and request one. Find out more about Disney World's Disability Access Service Card here. Unfortunately, I was unable to find any information on Universal's Attraction Assistance Pass on their website. I have been told by Universal employees that the AAP pass is still offered. It is OK to take a time-out. I know a lot of people want to get the most bang for their buck so they get to the parks when they open and don't step foot out of those gates until the parks close. But a time-out in the middle of the day is one of the best things you can do to enjoy your trip...Especially if you're traveling with small children. It's hot, your kids are tired, cranky, maybe even a little overstimulated. Nap time in the park is not going to happen. 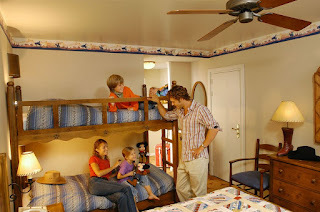 Taking time to leave the park, go back to the hotel, cool down, nap, and then make your way back into park refreshed is one of the best ways to enjoy a full day of fun. I have seen parents with distressed expressions lugging screaming, sweaty, exhausted kids out of the parks far too many times to try to make it more than 5 hours at a theme park with my son without taking a break. Having a little time out will make for a more enjoyable experience for you and your kids. Magical memories for all, right?! This tip is strictly a Disney Parks service. In each of the Disney World theme parks a "Baby Care Center" is available for moms, dads, and babies. The one in Magic Kingdom is my favorite. Here you will find private rooms for breastfeeding, a large changing room with several cushioned changing tables, a comfortable sitting area with television playing Disney Jr. programs or Disney animated movies, a kitchen equipped with a microwave for preparing baby food/bottles, and even diapers, wipes, pacifiers, sunscreen and other supplies for sale. My son is two but I still take him to the baby center at least once during our trips. Being in a quieter, calmer environment to have a snack, juice, and a few minutes of T.V. time while the rest of our party is enjoying a "big kids" ride can do wonders for an excited toddler. Very good advice!! For me point 5 is very important, this is why we are staying at phpremiere condo hotel and not at the park. I need time to get away from the busyness otherwise it would be too exhausting! !